Alawi children the Army of Conquest claims it found wandering after their parents abandoned them in Ishtabraq, late April. Note how uniformly happy they appear at this turn of events. On April 25, 2015, militants of Jabhat al-Nusra and Islamist allies in the "army of conquest" seized Jisr al-Shughour in Idlib province - having taken the capitol Idlib a month earlier. On April 25 they also took control of an Alawi (Alawite) village named Ishtabraq (Arabic: اشتبرق - translates something like "glimmer") and reportedly committed a massacre. In a letter dated April 28 (online copy of May 1 re-send to Security Council), the Syrian government informed the United Nations that "two days ago" "the terrorists killed some two hundred civilians, most of them women and children. The bodies were dumped in the fields, in the open." The letter also alleges "The Turkish Army provided logistical support and intense covering fire for the recent terrorist attacks on Jisr al-Shughur and Ishtabraq, and before that on Idlib, Kassab and Aleppo. The attacks were therefore a direct Turkish attack on Syria." An April 29 report in al-Masdar News by well-informed journalist Leith Fadel has a confirmed minimum of 54 local civilians killed, with 65 unaccounted for, many probably dead in the fields. Soldiers who escaped the National Hospital in late May had to walk some of these fields and said bodies were still there rotting then - some but not all victims were civilians, they said. There is a claim that the Islamist attackers used chemical weapons (see section below) In addition, many people were abducted, including women and children, with some reports of 200 taken, and over 100 being reported to the Syrian Observatory for Human Rights. Available details are still sketchy and confused in June. So far the subject has been debated on social media, but barely mentioned in the media or by world powers, outside Syria. It seems too large and credible an allegation to stay that way, and in the interest of catching ourselves and the public up on the alleged details, here the CLOS page. 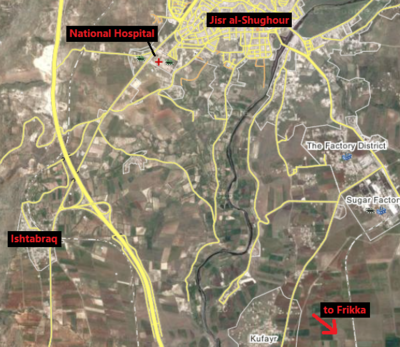 Location: just SW of Jisr al-Shughour, near the besieged National Hospital - on Wikimapia, labeled as an Alawi village. In an interview with Al Jazeera news channel last month, the leader of the Nusra Front urged members of the Alawite sect, another minority, to change their beliefs and to renounce President Bashar al-Assad, a fellow Alawite, if they wanted to remain safe. In a letter dated April 28 (online copy of May 1 re-send to Security Council), the Syrian government informed the United Nations that "two days ago" "the terrorists killed some two hundred civilians, most of them women and children. The bodies were dumped in the fields, in the open." Well-informed journalist Leith Fadel, with contacts in the area, first reported On Facebook April 26 that 130 were killed. An April 29 report in al-Masdar News by Fadel, however, a confirmed minimum of 54 local civilians killed, with 65 unaccounted for, fate unknown, besides those acknowledged as taken captive. That gives 38 members of this family taken, fates at rebel discretion. The early list of 85 missing contains 25 named Jarad ( ﺟﺮﺍﺩ ). Entry #40 is Zaher Jarad, fate unclear as of April 29. At right is an image from a local facebook group, posted May 11, of martyr Zaher Jarad with his captors, photo apparently found among rebel social media. It seems he's being threatened with two different knives here, and the site's researchers felt confident he was now dead. As noted above, he was listed in June as Zaher Jawdat Jarad, age 38, the only confirmed martyr out of 36 described as "slaughtered" ( ذبحاً ). AFP reported on the 30th that the number had been raised; "(SOHR reported) some 200 people were being held by Al-Nusra and allied forces. ... The Observatory said they had been taken hostage from Jisr al-Shughur and the nearby Ishtabraq area during the battle for the town." There would be acknowledged captives from both [places, but this could also be the Ishtabraq victims alone, made ambiguous with this non-specific either-or aspect; to read the report, it could be just a few Ishtabraq defenders taken and none of their family, for example. 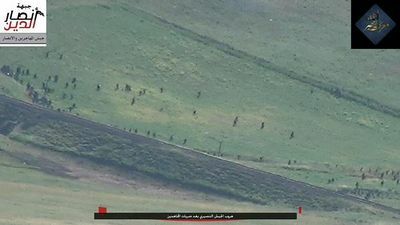 Above: around 56 captive men, from an Islamist rebel source, via loyalist source "Eshtabrak alAsad" on Facebook, May 13. There are other photos of men in smaller groupings. The total number just from photos is not clear at the moment. Likewise, whether they were captured in Jisr al-Shughour, Ishtabraq, both - or even neither - is not certain at the moment. Captive Alawi children aren't shown as that; the seven that the Islamist brigades showed in the inset photo (from this Facebook post, other sources confirm), and also in a video (May 11 Youtube posting), are claimed to be found wandering after their parents abandoned them. Either way, these were then in the "protective custody" of the Islamists, and likely stand in for a larger number. The fact that these ones were acknowledged and shown might bode well for their prospects. But conversely, there may well be others not acknowledged and more vulnerable to grim futures of one kind or another. Captive women don't seem to be acknowledged, from the limited sources we've seen so far. On Monday (April 27), the foreign ministry sent a letter to the United Nations alleging that “terrorists have massacred nearly 200 civilians, the majority of them women and children, in Ishtabraq.” It alleged the bodies of those killed had been left in fields in the area. Note the town isn't named, and the time of the massacre isn't specified. But Fisk describes coming to Frikka and then proceding towards the national hospital, and seeing the sugar factory in between. As the map up top shows, that suggests it was either Ishtabraq or somewhere else quite nearby. The Syrian Al-Qaeda group “Jabhat Al-Nusra” – in cooperation with Harakat Ahrar Al-Sham, Jaysh Al-Muhajireen, and Ajnad Al-Sham – captured the predominately Alawi village of Ishtabraq in southern Jisr Al-Shughour after three days of fierce firefights in the surrounding area. Jabhat Al-Nusra and their allies originally captured the village of Ishtabraq during their capture of Jisr Al-Shughour; however, they lost the area during a brief Syrian Arab Army (SAA) offensive on Monday. When the Al-Qaeda affiliate originally took the village of Ishtabraq, they reportedly executed 54 civilians, while the status of another 65 villagers was unknown; this report was confirmed by the villagers who escaped this area before the Al-Qaeda militants entered and they were later interviewed by Sham FM News. The general conquest of Jisr al-Shughour was April 25. This suggests Ishtabraq was taken then, soon reclaimed, and taken again on the 29th. What followed sound like a second massacre. Facebook’s pages have circulated a footage shows survivors of Ishtebraq massacre bearing witness after al-Nusra Front stormed into the village. Hundreds of rockets, holding chemical substances fell down in Ishtabraq, prevented them from breathing, because of their resistance and facing the assault. In the village of Ishtabraq in southern Idlib province, reports of a massacre of dozens of Alawites have been circulating for several days, with both sides putting forward very different accounts of what happened. Rebel groups have also waged their own propaganda war. 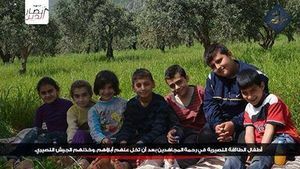 The Ansar al-Din Front militia, active in the Idlib area, Tuesday posted a photo of seven youngsters, seated and smiling in a field, and identified them as Alawites who had been abandoned by their parents during the recent fighting and chaos. It says the children are “under the protection” of the militia, which did not respond to a request from The Daily Star for further comment. SOHR April 25 The Nusra Front and Islamist factions could seize the village of Ishtabraq located in the southwest of the city of Jeser al- Shagour . Graphic video confirms that the rebel faction Ansar al-Din executed a captured regime soldier when they took over Ishtabraq in Idlib Province this week. 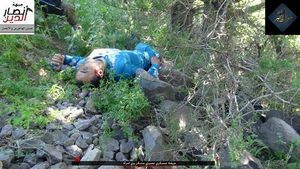 ... Pro-Assad outlets have been claiming a mass killing by Ansar al-Din in the village, captured on Monday. The only evidence at this point is audio, broadcast by a pro-regime radio station, claiming to be of families describing abductions and killings, and a prominent pro-Assad activist citing information from the “girl who used to babysit” him. Liberation of Ishtabraq south of Jisr El-Shugour by Jabhat Ansar al-Din on LiveLeak, 22:56 Heavy shooting from above, people fleeing, several dead soldiers shown. https://www.youtube.com/watch?v=irlYfMc4FgMtweet Idleb. "My house was destroyed, my friends were killed, my neighbours were taken" Zein from Ishtabraq telling his..."
مشاهد من تحرير قرية اشتبرق النصيرية والسهول المحيطة بها - features scene inset of Mark-1 plumbing truck. Leith Fadel, April 26 Everyone from the Khodor family have been massacred at Ishtabraq! All 11 family members, with children as young as 2 years old! Facebook posts were mentioned - more of these may be worth digging up. https://www.facebook.com/eshtabrakallasad?ref=br_rs Ishtabraq loyalist page (Arabic), covers the Islamist crimes there and other local issues. https://www.facebook.com/Talimia.Kdamia/posts/523902427749244 A list of 85 names of the missing with unknown fate - up to 25 from a Grad/Jarad family, ages not clear but male and female names appear. Martyr Zaher Grad/Jrad (25 Grads listed as abducted/missing - this one looks set to be beheaded, not clear. Appears to be a still from a rebel video where they threaten him. April 29 photo, 7 children smiling in a field, same stamps as prisoner men photos "And some of the prisoners. Kids May God be with them"
Zaid Benjamin June 10 Jabhat al-Nusra summarily executed 30 Durzi men in Qaleb Lawze town in #Idlib. The 2nd sectarian massacre in the province after Eshtabraq. May 1 Urs link, photo of a victim. 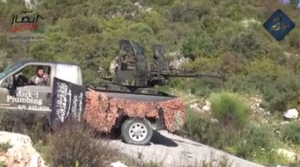 Julian Röpcke ‏@JulianRoepcke · Apr 28 Finally some #footage of rebels taking #Ishtabraq, S-W of #Jisr_Al_Shughur. Julian Röpcke ‏@JulianRoepcke · Apr 28 Gosh! See multiple-vehicle collision of fleeing #Assad forces South of #Ishtabraq. Abdul ‏@al_7aleem · Apr 26 @BosnjoBoy @leithfadel 8 hours later still 0 evidence of Ishtabraq massacre save Leith's claims and a fake image by SANA from November. GEOrge ‏@ArtWendeley · Apr 28 #Idlib: Still not clear what happened in Ishtabraq. Pro regime sources are reporting a rebel massacre. June 10 conversation below Zaid Benjamin's tweet "... Istabraq when claimed over 120 civilians killed, proven to be fake"
Rebel 1: GET BACK NOW! Rebel 2: Where are you from? This page was last edited on 18 June 2015, at 23:08.